Born in the Dutch region of Overijssel, Johan Barthold Jongkind spent most of his life in Paris, where he was in close contact with followers of the new movements in French painting. He attended the Academie voor Beeldende Kunsten in The Hague from 1836 until 1845, when he received a grant from King William to travel to Paris to study under the Romantic landscape artist Eugène Isabey. He soon established ties with painters of the Barbizon School who, like him, sought inspiration in the direct observation of nature and were interested in capturing light and atmospheric effects. He began to exhibit at the Salon in 1848 and took part in the Exposition Universelle in 1855, but although his works were well received by critics and public, he was forced by his debts to return to his country of birth. In 1860, after five years of relative isolation, a group of friends, among them Camille Corot, organised a sale of paintings to finance Jongkind’s return to Paris. Around this time his relationship became firmly established with the dealer Firmin Martin, who introduced him to Madame Josephine Fesser, with whom he maintained a close relationship until his death. 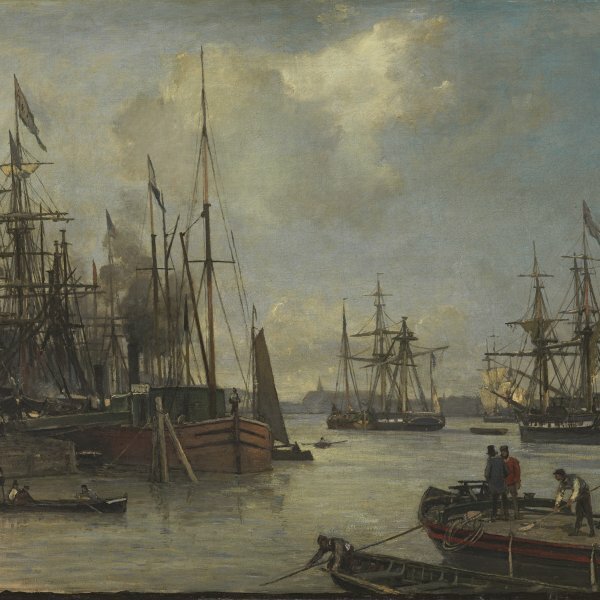 Although he continued to travel to the Netherlands during the rest of his life, his connection with the French art world became increasingly intense: he exhibited at the Salon des Refusés and met, among others, Eugène Boudin and Claude Monet, over whom he exerted considerable influence. In 1862 Jongkind began to produce series of etchings inspired by Dutch scenes and landscapes, motifs which had always played an important role in his work. He lived with Madame Fesser in La Côte-Saint-André from 1881 onwards.